Pixar Animation has done it again. Although it’s hard to say exactly what it is Pixar keeps doing, since no two Pixar films are alike. Most of the greatest animated films of recent years are products of Pixar, and part of what makes them so great is their phenomenal appeal to all ages. There have always been kids’ movies with jokes aimed at parents, but Pixar films have scenes that leave kids enthralled while conjuring tears in the eyes of adults; the very same scene touches both. The Incredibles is certainly no tear-jerker, but it’s not trying to be. The Incredibles is truly smart, funny and exciting. It joins the ranks of the great superhero movies (granted, a short list) and emerges as one of the few films of the year that’s truly worth your eight dollars. The film opens with Mr. Incredible (Craig T. Nelson) fighting crime and showing off his super abilities. Right from the start, The Incredibles employs some great action sequences, as well as some hysterical visual gags. Mr. Incredible’s wife, Elasti-girl (Holly Hunter), has the ability to stretch in just about any way imaginable and makes the remark that her husband needs to be “more flexible” with her. After the fun opening scenes, The Incredibles jumps ahead to a time in which the public has turned against superheroes and forced them into normal lives. The Incredibles now live in the suburbs where they work desk jobs and desperately try not to expose their superpowers. Itching to escape his retirement and return to the good old days, Mr. Incredible leaps at the chance when a mysterious woman recruits him for one last mission. All of Pixar’s films are beautifully animated, but a quality story always comes first. The Incredibles is founded on a great idea; once the action kicks in, the story is on par with most superhero stories, but the idea of superheroes who have entered retirement is a good one. There’s plenty of clever satire on the monotony of everyday life, as well as family bickering. The four-way argument at the dinner table is verbally similar to what every family has experienced, but this one involves supersonic speed, freezing powers and force fields. Much of the plot will be just out of reach of some younger viewers. Whereas children easily understood that Nemo was lost or that Woody was in danger, they may not all grasp why Mr. Incredible’s marriage is in danger. That won’t make much of a difference though, because The Incredibles is an absolute joy to watch. The characters are fun and the story has a good heart concerning the importance of family, but the action ultimately takes center stage, and it’s breathtaking. The animation is a wonderful balance between realism and the typical cartoon, and this environment sets the stage for some amazing action scenes. The filmmakers created a world in which anything is possible and used it to its fullest extent, filling every moment with delightful images. 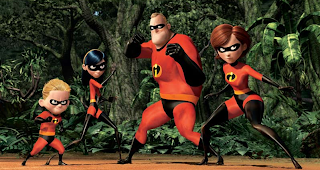 The Incredibles are a fun family and they have no trouble making the movie work. There are also some memorable minor characters: Frozone (Samuel L. Jackson) uses his freezing powers to fight crime alongside the Incredibles, and Edna Mode (director Brad Bird), the designer of all the greatest superhero suits, is an absolute riot. The film could probably have benefited from a little more time spent with these side characters, but that’s a pretty minor criticism. The Incredibles is not only fun, but a marvelous achievement in animated film. Some day, Pixar’s going to make a movie that’s simply “good,” and it’s going to be a huge disappointment; on the other hand, perhaps that day won’t come anytime soon. They’re now officially six for six.